I must say; SEO and writing go hand in hand. The blog posts or the articles published on the website and its sharing on the social networking sites plays an extremely important role in promotion and marketing for shaping the business image and its further brand awareness. Well, the content added or shared to the social sites may be original or copy-written; but you must always need to know SEO while generating the content for all your marketing needs. Here, in this SEO copywriting guide, we have focused on the copy-writing tips that every online publisher must follow for making quality content for their websites. Web developers and online publishers used to search; how do you do copywriting and marketing? How do I become a good direct marketing copywriter? What is writing copy for advertising? What is a copywriter for Website? What is copywriting - In simple words, copy-writing is an art of re-writing the original content in simple and own words that would easily understand the topic. This may sound simple and easy. But the fact is different. It is not just like hire a copywriter & re-writing the copy of any content from the first word to the last. But it is much more different and the new content need to be a unique one. In copywriting, you cannot copy and paste the whole sentence as it is. You need to make some but meaning changes and alterations in the content without changing its subject and the intention. If you have seen, there are lots of SEO copywriting course or freelance web copywriter are available including website copywriting services that will help you to generate marketing copy for your web pages. As an online publisher, you must learn SEO content writing methods that we usually talk on problogbooster. We have published several pages on blog writing techniques that will help you learn the copywriting from home for free. 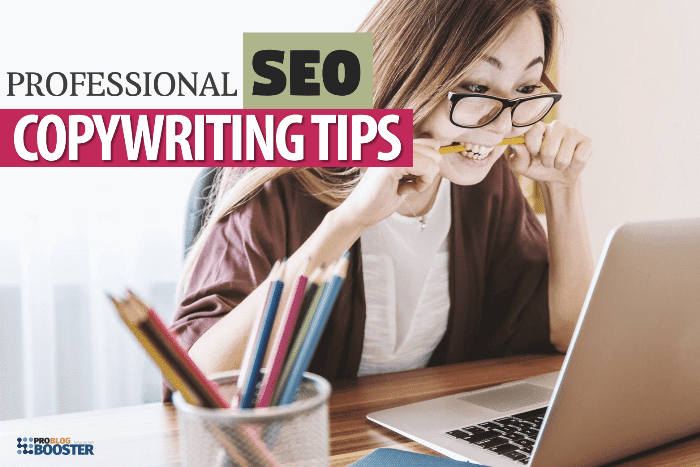 In addition to that, today I am going to share most demanding the professional copywriting tips that'll help you generate SEO optimized web pages and content which drive more organic traffic to your blog/website. Copywriting is a technoscientific writing form and it is an essential factor for better SEO. The content needs to shape in such a way to increase the number of visitor for the brand. And for this, the content needs to interesting, engaging, informative and must include the targeted keywords. The copywriting is all about re-writing a valuable content in an extended format. 1. Add a right title. Every content starts with its "TITLE". If you want a reader to read the content, first of all, you need to catch attention with the title. A title is a key that converts a visitor into the reader. Design the title perfectly that instantly grab the attention of the visitor. While framing out the title think like you are the reader. Make it sure that the title should be SEO friendly. Include one keyword in the title so as to get displayed on the search engine. It will help you grab the attention of search engines as well. 2. Always focus on keywords. Keywords are black sheep of the content writing. Adding keywords to the content do matter as they help the content to appear in the search engine. Keywords are top ranking factors to get top rank on the search pages, so they need to be considered while copywriting. Longtail keywords with great information about the content make the content rich and easily traceable. You must use the keywords in the title, heading, sub-titles, introduction as well as your conclusion. 3. Eliminate overuse of buzzwords. You must know the targeted keywords is the power of SEO; it helps driving targeted traffic. But you need to be careful of overuse of buzzwords or keyword that further makes the negative impact on search engines. Spammy use of keywords makes the content poor and can damage the brand images on search rankings. So be concerned to limit the use of keywords. Also, note that the space between the two keywords is not that much closer. Keep appropriate space between consecutive words you are targetting into the article. How do you format the content for your niche is equally important. Never forget the "first impression is the last impression". Be careful while framing a paragraph. Be simple, up to the mark! Keep it short and friendly. Avoid writing kilometers sentences. Cut out the excessive content and aim to average the sentence of about 15 to 20 words. Note that; the content with headings and sub-headings is recognized as a rich content. The proper formatting makes it easier for the reader to understand the topic easily. You can even point out the important discussion in the bulleted pattern or number format. Short sentences, small paragraphs, heading, sub-points, the bulleted list makes the perfect impressions on the visitor's mind and increases the value of the content. The keywords are kings of the content and if they are linked, they can do miracles. The outbound (external) links and inbound (internal) links are excellent ways to make the content rich. With outbound links, you can connect your material to some other pages or website that adds value to your topic; whereas; with the internal links, you can keep the reader within your universe and can save their valued time. Adding links will definitely help you to enrich the user experience which is the ultimate goal of copywriting. 6. Add images making the content rich. To make the content richer, you must add related photos, images to the content. Images speak more than words and thus keep the reader remains stuck at your web pages. With the images, you can convey your message more easily, quickly and moreover, that will offer extra SEO value to your content. Images are worth important to increase the weightage of the content. Be sure that every image you include & should be followed by a caption that may include keywords or the words related to your topic of the page. Always write informative and clear captions to your images and makes the content richer in search engines point of view. 8. Focus the topic & be clear. While selecting the content for copywriting, you should be very clear about what kind of topic your content should be. Also, the content you write should be clear to understand and should not cultivate any confusion. 9. Maintain the simplicity of the content. The content should be rich but at the same time, it should be simple to understand. It is obviously not necessary to write top-graded comprehensive material but to be written precisely with regularly used words. The words, phrases & sentences you using for the message that you wanted to convey should be simple so that the targeted audience could understand the same. Through copywriting the content, your intention is to provide the information, demonstrating tutorials or sometimes making the reader aware or buy the product, service etc. And thus your content needs to fascinating and interesting one. Interesting content converts the visitor into a subscriber. Make it scan-able, engaging, visually appealing, tell stories, news jack, etc. Though it is a copywriting, you need to think outside of the box. Serve the same idea in extended form in a different way and influence the reader with your creative copywriting. Come up with best copywriting content including with real facts, stats, appealing stories, and personal experiences; all these help you lead the race ahead. No doubt, you need to be grammatically correct while writing any content. Well, active voice content is much easier to understand and can convey the message faster and better. On the other hand, passive voice content is poor and sound weak. Clear and up to the mark kind of content is always effective. Yeah, in other words, a copywriter is a skilled person of words, but don't need to be smart. Rather you may say, copywriting is like a salesmanship and is NOT at all a wordsmith. Through the content, you address the people, so first of all, you need to know your audience. You must know; what your follower, subscribers, readers and daily visitors want to know from your write-up. If you are an affiliate marketer, then it is required to figure out why your reader and people should buy your product and then you need to work accordingly to shape your content. Copywriting is an art and thus needs thorough research. The content you write should be more informative, satisfying, useful, valuable, educational, appealing, engaging, likable and thus research is a must. While proofreading you must try to avoid all sorts of distractions while you read and at the time of copywriting. First of all turn off your phone, sign out from all the social media and then start writing. Write in more relaxed and personal style so as to make it appealing. Make it feel like having a one-to-one conversation to make it more successful and fortunate. People like the pages when they relate themselves to the content. Even though it is a copy-writing, it is must to write in the positive language. Positive language speaks great and thereby adds value to the content. Stories and personal experiences offer an added layer of emotional touch. This adds to the excitement of the visitor and keeps them coming back to your content for more. It will improve the page views for a long run. The ultimate goal of copywriting is to use those words that urge the readers to take an quick action - it is called as CTA "Call-To-Action". An effective "call to action" is a necessary part of any best copywriter websites. Always focus on CTA while you do copy-writing work. Copywriting is an art of creating the content that can attract the readers and can bring more and more traffic to the website. It is one of the powerful marketing tools and thus needs to be of high-quality, SEO search-friendly. It needs to be great to turn the visitor into the buyer for the product or services. With proper tips and guidelines one can improve the copywriting art and can definitely achieve the above that seems very hard at the beginning. So, start writing the high-quality copy of the content to attract more and more visitor and convert them into leads and permanent customers.